Several of the solar and earthly displays have been spectacular to look at. For example, space weather announced a magnificent eruption on June 7th, coming from the magnetic fields above sunspot complex 1226-1227. The blast produced an M2-class solar flare, an S1-class radiation storm, and a massive coronal mass ejection (CME). A recording of the blast from NASA’s Solar Dynamics Observatory can be seen on YouTube with a commentary from solar physicist C. Alex Young of NASA’s Goddard Space Flight Center: http://youtu.be/Q_3u_0NN7OM. On June 5th, the Chilean Puyehue volcano started erupting, after lying dormant for 50 years. On June 15th, most of the world (other than North America) was able to witness a total lunar eclipse. The moon spent 100 minutes fully engulfed in Earth’s shadow, making this the longest lunar eclipse in nearly 11 years. See photo from the eclipse below (from Marek Nikodem, Poland) and more photos can be viewed on the space weather site: spaceweather.com/eclipses/gallery_15jun11.htm. The June 15th lunar eclipse was part of a rare three-eclipse series of events that occurred on the new moon June 1st, the full moon June 15th and the new moon July 1st. Two partial solar eclipses a month apart and one total lunar eclipse exactly in between. The next lunar eclipse will occur on December 10, 2011 and will also be a total lunar eclipse. That event should be visible from the western United States and Canada. The first day of northern summer began with a solar flare. Magnetic fields above sunspot complex 1236 erupted on June 21st, hurling a coronal mass ejection (CME) almost directly toward Earth. The influence of solar and lunar activity on weather patterns, earthquakes, volcanic activity, human health and behavior, social unrest and on human flourishing as well has been discussed in previous commentaries. Now we’d like to discuss the possibility of increased solar activity influencing recent social unrest, as indicated by the GCI monitoring site in Saudi Arabia. The data presented here was taken between January 25 to February 28, 2011 from the recently installed GCI monitoring site in Saudi Arabia. During this period of time, much of the global attention was focused on the Egyptian revolution and the start of the social unrest in Libya. In Figure 1 below, the total spectral power (0.5 to 45 Hz on x-axis) of the magnetometer data, is plotted against the dates (Jan 25 to Feb 28, 2011, y-axis). The total spectral power includes the activity of all the Schumann resonances as well as other oscillating magnetic field frequencies, such as Alven waves (field line resonances). Daily descriptions of events are included on the chart, which were obtained from an article titled: A chronicle of the revolution that ended the three-decade-long presidency of Hosni Mubarak. The daily descriptions of the events have been abbreviated in order to fit on the chart; the full descriptions are included in the Appendix. Due to space constraints, the events listed on the chart are only for days where magnetic field intensity peaks occurred. Currently, we are not yet able to statistically correlate these events with the magnetometer data or the magnetic field data showing collective emotional intensity. However, it is a focus of GCI’s research and we will continue to examine data from different locations around the world related to human health and behavior, earth changes and social activity, in order to examine the relationship and effects of environmental field factors on humanity and vice versa. Figure 1. 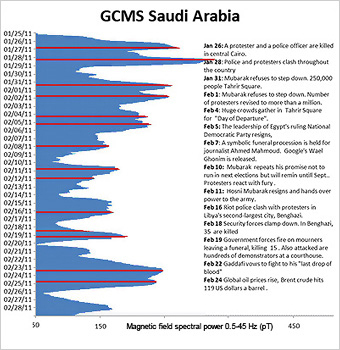 Magnetic spectral power from GCI magnetometer in Saudi Arabia, from Jan. 25 to Feb 28, 2011. Figures 2 and 3 display the F10.7 solar radio flux index from NASA’s Space Physics Data Facility. The sun emits radio energy which varies in energy level, depending on the number of spots on the solar disk. Solar flux from the entire disk at the frequency of 2800 MHz (10.7 cm wavelength) is recorded by a radio telescope. The F10.7 solar radio flux is considered one of the best indices of overall solar activity. It represents a measure of diffuse, non-radioactive heating of the coronal plasma trapped by magnetic fields over active regions. One solar flux unit (sfu) equals 10-22 watt/m2/Hz on earth. As discussed in previous commentaries (e.g. January 13, 2010), the first researcher to link human excitability with solar activity was the Russian scientist Tchijevsky. After compiling the histories of 72 countries from 500 BC to 1922 AD, Tchijevsky constructed an “Index of Mass Human Excitability”. Furthermore, he found that 80% of the most significant human events occurred during the 5 years around the peak of sunspot activity. When the data is examined, it appears that when solar-geomagnetic activity is changing most rapidly, it has the greatest potential to affect human moods, behavior patterns, creativity and historical trends. Figure 2. Solar flux units plotted against years of 1985 to 2011. In Figure 2, the last 2 solar cycles (22 and 23) are plotted, along with the onset of Solar Cycle 24. As an example, two major social events that had substantial carry-over effects on the world were chosen for the last two solar cycles. 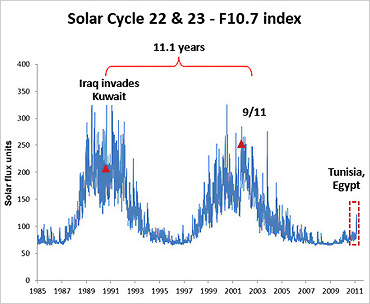 Iraq invaded Kuwait during the peak of the Solar Cycle 22. The 9/11 terrorist attacks on the World Trade Center occurred during the peak of Solar Cycle 23. Solar Cycle 24 has just started to become more active, and with this increase we have seen more earth changes and increased social unrest (not only in the Middle East, but in Europe, e.g. Spanish riots and the Greek protests.). Along with the continued increase of solar activity, more social “excitability” is expected in the months and years ahead. 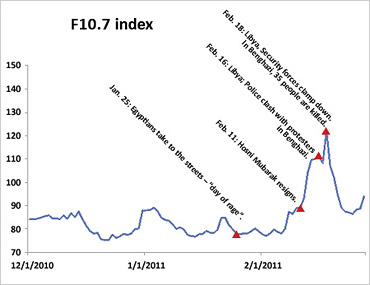 A more detailed view of the F 10.7 solar index compared to recent events in the Middle East is displayed in Figure 3. Political events have been correlated with increased solar flux. However, more detailed data analysis has to be carried out in order to scientifically understand the correlations, which is one of the goals of GCI. Figure 3. Solar flux units plotted against social activity in Egypt and Libya. As GCI adds more monitoring stations with magnetometers worldwide (our goal is twelve), this research should provide valuable insights into the interconnectedness between solar and geomagnetic activity (S-GMA) and human health and behavior, as well as social and environmental activity. GCI will continue to examine the relationship between solar and geomagnetic activity and the collective emotional response to major events. It is also possible that the collective human emotional response will affect S-GMA, as suggested by the psychic Edgar Cayce in the 1920’s. However, as already mentioned, the labeling of the peaks in Figures 1, 2 and 3 only represents a starting point from which GCI can learn more about the interconnectedness humanity has with the earth, solar and geomagnetic activity in relationship to social activity. We also acknowledge that not having been present in Egypt or Libya during the above time period, we do not really know or understand the intensity and types of emotional fluctuations that occurred as the various events unfolded. Through TV and news coverage, it is possible that the collective emotions of the global community also influenced the events. GCI has synchronized magnetometer data from our Boulder Creek, California location with the Saudi Arabian magnetometer during the time frame discussed. Differences in data between the two locations have been observed. A comparison of local and global magnetometer data to increased S-GMA and social activity will be discussed in future commentaries. Solar Cycle 24 activity will continue to kick up and reach its peak sometime in 2013. It is very likely that mass excitement and social unrest will also continue to increase in the next few years. This is an ideal time for GCI to research the interconnectedness of life on Earth, and the interactions between solar activity and Earth’s geomagnetic and ionospheric activity. As pointed out by Ertel (1996), times of increased solar activity not only coincide with social unrest, but also give rise to spurts in architecture, arts and science. Old social structures which do not serve humanity might be replaced with more suitable and sustainable models. This is a time of opportunity and possibility, and the chance to use these energy influxes to create humanitarian advances and a sustainable human flourishing. A major contribution each and every one of us can make is to increase emotional balance and coherence within ourselves. This will enable us as individuals to use these energy influxes to our advantage. By increasing our internal coherence, we can positively affect our relationships and our social environment, which in turn may be positively reflected in the global field environment. Together we can create great opportunities during this cycle of increased solar activity. January 25: On a national holiday to commemorate the police forces, Egyptians take to the streets in large numbers, calling it a “day of rage”. January 26: A protester and a police officer are killed in central Cairo as anti-government demonstrators pelt security forces with rocks and firebombs for a second day, according to witnesses. Police use tear gas, water cannons and batons to disperse protesters in Cairo. Witnesses say that live ammunition is also fired into the air. January 27: Protests continue across several cities. Hundreds have been arrested, but the protesters say they will not give up until their demand is met. Lawyers stage protests in the Mediterranean port city of Alexandria and the Nile Delta town of Toukh, north of Cairo. January 28: Egypt remains on edge, as police and protesters clash throughout the country. Eleven civilians are killed in Suez and 170 injured. No deaths are reported in Cairo. At least 1,030 people get injured countrywide. January 29:Mubarak announces that he has sacked the cabinet, but he himself refuses to step down. Thousands of anti-government protesters in Cairo’s Tahrir Square stand their ground, despite troops firing into the air in a bid to disperse them. Mubarak appoints a vice-president for the first time during his three decades in power. January 30: Thousands of protesters remain in Cairo’s Tahrir Square. The crowds are cheering when El Baradei addresses protesters in the square saying, “What we started can never be pushed back”. Turkey has announced that it is sending aircraft to evacuate its citizens, after the US embassy in Cairo has advised all US citizens in Egypt to consider leaving as soon as possible. February 1: Hosni Mubarak announces in a televised address that he will not run for re-election but refuses to step down from office – the central demand of the protesters. Khalid Abdel Nasser, son of the former Egyptian president Gamal Abdel Nasser, joins the protest in Tahrir Square. The number of protesters in Cairo’s Tahrir Square is revised to more than a million people. Thousands more take to the streets throughout Egypt, including in Alexandria and Suez. February 2: Preparations begin for another day of demonstrations against President Hosni Mubarak’s regime. The army is still deployed with tanks in different positions in and around Tahrir Square. Clashes between anti-government and pro-Mubarak protesters break out in Alexandria. Violent clashes rage for much of the day around Tahrir Square. Up to 1,500 people are injured, some of them seriously, and by the day’s end at least three deaths are reported by Reuters news agency. Pro-democracy protesters say the military allowed thousands of pro-Mubarak supporters, armed with sticks and knives, to enter the square. February 3: Bursts of heavy gunfire aimed at anti-government demonstrators in Tahrir [Liberation] Square leave at least five people dead and several more wounded, according to reports from Cairo. February 4: Hundreds of thousands gather in Cairo’s Tahrir Square for what they have termed the “Day of Departure”. February 5: Thousands who remain inside Tahrir Square fear an approaching attempt by the military to evacuate the square. The leadership of Egypt’s ruling National Democratic Party resigns, including Gamal Mubarak, the son of Hosni Mubarak. The new secretary-general of the party, Hossam Badrawi, is seen as a member of the liberal wing of the party. February 6:The Muslim Brotherhood says in a statement that it “has decided to participate in a dialogue round in order to understand how serious the officials are in dealing with the demands of the people”. Banks officially re-open for 3.5 hours, and traffic police are back on the streets in Cairo, in attempts to get the capital to start returning to normal. Al Jazeera correspondent Ayman Mohyeldin is detained by the Egyptian military. He is released seven hours later, following a concerted appeal by the network and Mohyeldin’s supporters. Protests continue in Tahrir Square; there are reports of gunshots fired by the army into the air near the cordon set up inside the barricades, near the Egyptian museum. February 7: Thousands are camping out in Tahrir Square, refusing to budge. While banks have reopened, schools and the stock exchange remain closed. A symbolic funeral procession is held for journalist Ahmed Mahmoud, shot as he filmed the clashes between protesters and riot police from his Cairo office. Protesters are demanding an investigation into the cause of his death. Wael Ghonim, a Google executive and political activist arrested by state authorities, is released. Some see him as a potential figurehead for the pro-democracy camp. February 9: Labor unions join protesters in the street, with some of them calling for Mubarak to step down while others simply call for better pay. Massive strikes start rolling throughout the country. Thirty-four political prisoners, including members of the Muslim Brotherhood are released, according to Egyptian state television. February 10: The newly appointed Culture Minister, Gaber Asfour, quits. Amid rumors that he will be stepping down tonight, Mubarak gives a televised speech which he says is “from the heart”. He repeats his promise to not run in the next presidential election and to “continue to shoulder” his responsibilities in the “peaceful transition” that he says will take place in September. Protesters in Tahrir Square react with fury when Mubarak says he’s remaining in power until September. Protesters wave their shoes in the air and demand the army join them in revolt. February 11: After tens of thousands people take to the streets across Egypt in angry protests, Hosni Mubarak resigns as president and hands over power to the army. The announcement is made by Omar Suleiman, the vice-president, just after 16:00 GMT. February 14: Protesters leave Tahrir Square in the morning but a few thousand return later, most of them protesting against the police. The military leadership issues “Communique No 5”, calling for national solidarity and criticizing strike action. It urges workers to play their role in reviving the economy.